If you've been following the Garmin story, the Garmin Vivoactive 3 Music should pretty much explain itself. The latest sports watch from the fitness powerhouse takes the Vivoactive 3 we know and love and bestows on it the gift of song, letting you play your tunes from your watch instead of your phone. We really liked the Vivoactive 3 when we reviewed it last year, so the idea of getting the same watch but with more features seemed like a shoo-in. The Vivoactive 3 Music still offers the same features as its less musical version, including Garmin Pay for phone-free transactions. 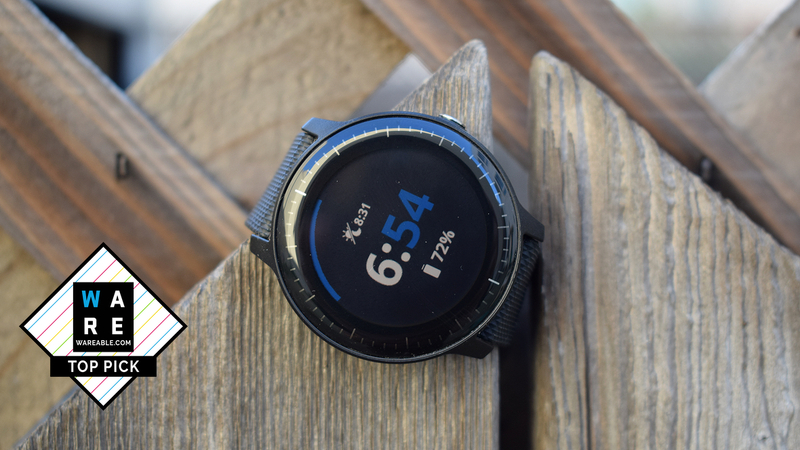 When we reviewed the Vivoactive 3 we wondered whether Pay was really that useful: Garmin sold the idea of heading out the door for a run sans smartphone, knowing you could still buy that post-workout juice - but what of the music? With the Vivoactive 3 Music, that scenario is much more plausible. This is Garmin's second go at fusing music with a sports watch. Its first, the Forerunner 645 Music, brought the sound of music to its more running-focused watch line. The Vivoactive line has always been seen as Garmin's riposte to the Apple Watch, which gets sportier with every new addition. At $299.99, the Vivoactive 3 Music also costs $50 more than the Vivoactive 3. So is it worth it? Here's our verdict on the latest addition to the Garmin family. On looks at least, the Vivoactive 3 was a major step-up on what had come before it, morphing from the unsightly bulky rectangle into a circular face. The change between that and the Music is a little less dramatic, but still a notable improvement. This one actually only comes in black, but this time Garmin's gone for a chemically strengthened glass finish that's glossier and much nicer than the Vivoactive 3's metallic look. We very quickly started collecting scratches on the metallic ring around the Vivoactive 3's face, but (so far) the Music has remained scuff-free. The case measures just a little over 43mm, same as the Vivoactive 3, and comes with a 20mm quick release band. Garmin offers a range of straps to buy separately at $30 a piece, but as this is a universal fitting you can swap in anything else with the 20mm fit (some of Garmin's watches use its proprietary QuickFit straps, but not this one). Overall it's light and perfectly comfortable to wear; I've worn it to bed and never found it annoying. The watch has a touchscreen, but there's a single button on the right side of the face so you can easily start and pause workouts with sweaty fingers. That's something we're always grateful to have in a sports watch, though you will need to use the touchscreen for controlling music playback. Thankfully Garmin's touchscreen tech is pretty good these days and on the Music we've found it pleasantly responsive. It's also worth noting as a small but welcome improvement: as the glass now stretches seamlessly from edge to edge, it feels a little better to swipe a finger across the screen. As mentioned earlier, the Vivoactive 3 Music has all of the same sports tracking features as its tuneless sibling. But the Vivoactive 3 Music also works as a smartwatch, supporting notifications, Garmin Pay and a few other "smart features". Notifications still aren't handled as nicely as they are on the Apple Watch, but you can send quick replies if you're on Android (sorry iPhone users) you can send quick replies using Garmin's cut-out responses. Sadly Garmin Pay wasn't working on our review unit, but this will function in the same way it works on the Vivoactive 3. Once you set it up in the app with your bank card, you can hold the button down and then tap on the wallet icon before tapping your wrist on the payment terminal. You'll also need to create a password that will need to be entered once every 24 hours to stop someone running off with your watch and splashing out at your expense. Let's talk music. Garmin's put aside space for around 500 songs, which can be either uploaded as files from a computer using the Garmin Express program or synced from one of Garmin's partner music services. Right now that list is comprised solely of iHeartRadio in the US and UK, but Deezer support is on its way too. If you're a subscriber to either you'll be able to sync your playlists to the watch and play them offline via Bluetooth headphones. For the review we were only able to try loading music on via Garmin Express as iHeartRadio support hadn't been added. The process is pretty straightforward, though a lot of users will understandably be far less familiar with the Express desktop application than the smartphone app. Once you've downloaded Express and signed in your account, it's just a case of connecting the watch with the USB cable and clicking the big 'Music' box. We did this on a Mac so PC users will have a slightly different experience, but Garmin Express helpfully scans your music library, making it easy to tick the ones you want to sync. On the watch, you can view your music by playlist, artist, genre, album or song. It'll also arrange your podcasts into their own section. Though we long for Spotify support, we've still found Garmin's music system pretty smooth. Connecting headphones is easy and the watch has worked with all the Bluetooth headphones we've tried. Meanwhile the interface is easy to navigate, and other than one blip where no sound was transmitting to the headphones, playback has been smooth. This is foremost a GPS sports watch that comes preloaded with a fistful of workouts including running, biking (indoor and out), swimming, rowing, skiing, golf, yoga and a bunch of gym activities. Just taken up roller derby? You can also create a custom workout by taking the closest thing from the existing list and lets you tweak data screens and alerts. We took it out for a three-hour bike ride with GPS running, and the post-workout map, heart rate and speed data suggested there were no problems in tracking our workout. Elevation data also seemed to trend with our climbs and descents. Should you want to, you can pair the Vivoactive 3 Music with other sensors via Bluetooth or ANT+, and the watch can be set to detect these automatically when you enter a workout mode. That's helpful for biking if you want to use a cadence sensor, or maybe you want to do some high-intensity workouts and would rather rely on a chest strap for heart rate tracking. On one run it picked up that I was wearing a chest strap, throwing up a notification to ask us if we wanted to pair it and read the heart rate data from there instead. This isn't a feature you'll find on every sports or running watch, so we're always pleased to see it when it's there. Of course you won't get some of the more advanced running features of the Forerunner 645 Music, like support for the Running Dynamics Pod, which gives you detail on stride, cadence and vertical oscillation. For running, the heart rate sensor performed about as well as it has on all the recent Garmin watches we've tested, and post-workout readings compared to the Polar H10 chest strap were decent. We're seeing Garmin's readings get better here, but - stop us if you've heard this one before - you'll probably still want to use a chest strap for high-intensity workouts, as this is where the inconsistencies start to show up. In terms of day-to-day health tracking, it's business as usual. You'll get your steps and, if enabled, continuous heart rate through the day. We've found Garmin's sleep tracking to be so-so in the past, and for the review it was fine. It's less accurate than other options out there, but this time I didn't get any wildly off readings. Garmin says it has some advanced sleep tracking features in the work that we should hear about soon. It's definitely due. Garmin says you should get about seven days of battery life in "smartwatch mode" (ie not powering the GPS or sports modes); up to five hours with GPS and music; and up to 13 hours with just the GPS. While that's mostly played out in testing, we did get the sense that running it for a few hours during a bike ride was draining the battery a little faster than that. We'll be keeping a close eye on this and will update if we notice anything else untoward, but otherwise the battery has behaved in line expectations set by Garmin. The question at the end of all of this is whether the music feature justifies an extra $50 over the Vivoactive 3, and we think this is going to come down to your music habits. If you're a die-hard Spotify user of the streaming age, much like us, it probably doesn't. However you're also paying for a slightly nicer design, and for people who want something they can wear all day, this might be equally important, if not more so. First long run with the VA3 music, only made it to 2:45 hrs before the low battery alert chimed in. Fully charged before starting. I as done by 3:00 so I completed my run but ... not great. I don’t have music set up yet so I was only using the gps feature. Otherwise, I’m loving the watch. Any suggestions on saving battery life would be great I have an ultra coming up and I need the watch to go 6 hours minimum.